The potential of technology to facilitate independent learning excites me. However, sometimes the tools for creating e-learning resources can lead to overly structured schemes of work which children move through in isolation. For the past few weeks I have been working on using e-learning resources to give children responsibility for their own learning, whilst trying to avoid these pitfalls. I recently ran a workshop for future school leaders at the National College and, given that my remit was participative technologies, I tried to make it as participative as possible. Throughout the session we used a wide range of online tools to collect the ideas and responses of both people in the room and those taking part online, organised around an online resource created with Google sites. This got me thinking about the structure of lessons in my class, and I wondered if I could use such tools to facilitate lessons where the children had more control over the pace of activities rather than this being dictated by my judgements. I thought I would try this out with a Geography lesson on water use which I had planned the previous year and delivered before, in order to judge the impact of this structure. 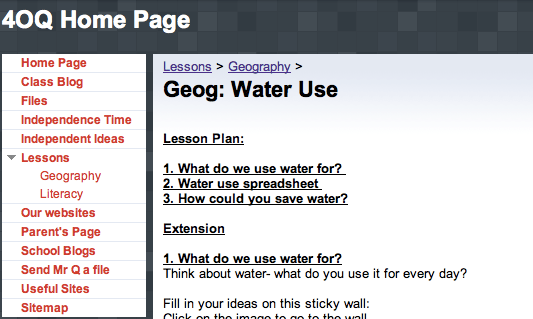 As this was a lesson with a number of online tools already integrated into it I thought it would be ideal. I set up the lesson as a page on our class website, with a clearly defined structure of activities, and a clear objective. One problem I envisaged with such an approach is the potential for every child to be sat at their screen completing activities and not actually communicating, or participating in any of the valuable group learning or modelling that goes on in a standard lesson. 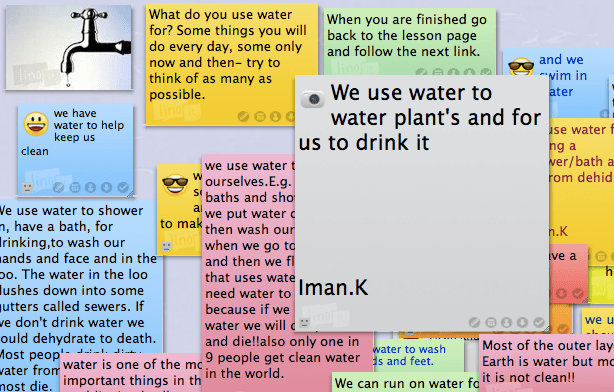 Therefore, I felt it was important to include collaborative tools, and the activity began with a lino-it wall to collect ideas on water use, and ended with a similar activity to share ideas on saving water. As this was the first time we had worked like this, I explained the concept of the ‘independent lesson’ to the class, showing the the structure and explaining how they would need to move through it themselves. They then got on with it, with some success. A few groups were so engrossed with the first activity that they didn’t move on to what I had deemed to be the main learning. I spent some time reflecting on the outcomes and questioning whether anything had actually been gained from conducting the lesson this way. Some children undoubtedly benefitted from taking the lesson at their own pace, be it faster or slower than the average, and the collaborative spaces had worked well to ensure this was not just an individual ‘computer lab’ style excercise. However, I felt I had missed a trick here- all I had really done was present a lesson that was planned as a traditional three part lesson using technology. To my mind, this was just substitution of tools, augmentation at best. What I was really looking for was redefining the learning in some way. To achieve this, I decided, was not going to involve taking an existing lesson and tweaking it; I needed to rethink how I might harness the concept to make use of more learner independence. The following week the idea came to me. We have recently implemented Alan Peat’s ‘Exciting Sentences’ across our school as models for improving writing. Although my class were familiar with some of these, there were a number of them that they needed to cover to get ‘up to speed’ with the whole school policy on what they should know before year 5. I originally planned to cover them one at a time in teacher directed sessions with time for practice and development, but I wondered if I could harness the ‘Independent lessons’ to give them more control. So, I created a general workflow that the children could follow through for learning each sentence type. If I was going to give them freedom over this structured course of work, I needed to build in some record keeping, so I began by creating a google doc where they could record what they knew already, provide an example, and see what areas they still needed to learn. They then progressed to a choice of resources with explanations of the sentence types they needed to learn, and moved on to a collaborative lino-it space where they could practice and develop the use of the sentence type. The collaborative element was really important here, as despite the fact they might be working on different things at different times, there was potential for modeling to each other, and supporting each other in any misconceptions or mistakes. Finally, they returned to their personal learning record to mark off what they had learned, and provide an example to demonstrate this to me. Rather than a lesson structure with a beginning and end, which relied on the class moving through it at least at a similar pace, this was more of a circular structure, which gave children choices and responsibility for what they were learning. As with any new structure for learning, it took time for the class to get familiar with this and start to use it productively. The first session we spent on it was not as productive as it may have been. When I first started teaching I would have taken this as a cue to simplify what we were doing, but more recently I have seen that children need time to explore and digest new ways of working, and when they have been given time to do this they often return to it to produce fantastic results. Having now spent three sessions on it this has certainly happened, they are now confident following through the various activities and are progressing well in learning the ‘Exciting sentences’ they need to cover. When I have ‘taught’ these sentence structures before I have always found it a challenge to encourage children to actually use them in their writing outside of the practice lesson. This time, not the case. 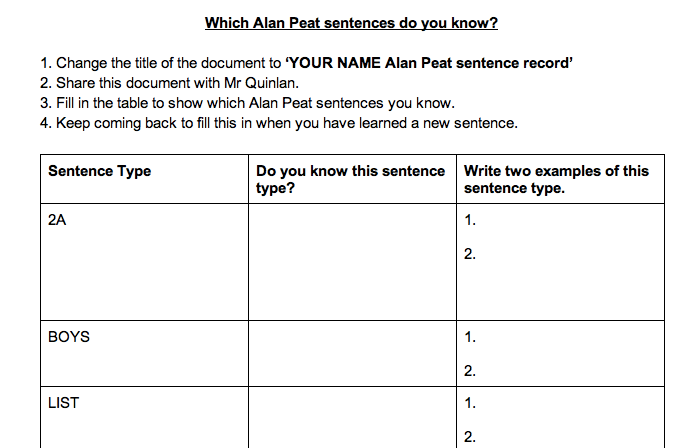 It appears that giving them the whole curriculum at once and allowing them to make choices about what they cover and when has encouraged them to take more responsibility for the learning, and this time I have seen many more children actively using the sentence types they have learned in their other writing. We talk a lot in our school of encouraging ‘independence’ in the learners we work with. Sometimes I know I can get stuck on looking for and encouraging this for it’s own sake, but what is the real value of such independence? To my mind, it is when learners can take control of their learning and take it to the next level themselves. Yesterday our TA was in charge of the class for a session, as I had to meet a newly arrived child. I simply asked them to keep working on their sentence types using these resources. When I returned, three boys presented me with a video camera full of footage they had recorded. They had finished learning the sentence types, so decided to take it to the next level by recording a series of videos to teach them to others. Far from being simple instructions, these videos are well structured, with a balance of learning and fun, and a cliffhanger ending to keep people coming back for more. You can follow their continuing series here. This wasn’t an intended activity, and certainly not a model for independence as ‘doing what the teacher wants without being asked’. These children had taken responsibility for their own learning, and taken it to the next level. They have also taken our resource to the next level, as I can now populate the google site with videos they have made to explain each sentence type. From what appears to be a fairly structured e-learning resource, these children have taken control. They may have broken free of the structure, but isn’t that what independence is all about? The challenge for me is designing resources and environments which structure learning in such a way as to allow this to happen. Central to this, I think, is a commitment to allow children to take responsibility, and support them in moving off the beaten track into making the learning their own. Technology in problem solving: tools or models? ← Previous Previous post: Technology in problem solving: tools or models?